Early on Sunday morning, a tanker truck caught fire on a highway near the Bay Bridge. 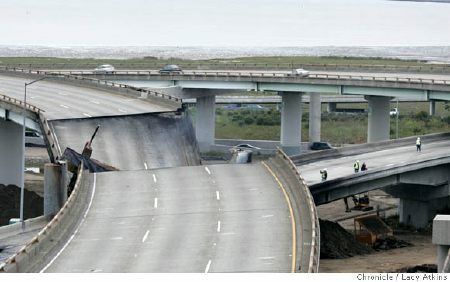 Unfortunately, it had stopped underneath another section of highway, which then melted. The main purpose of this odyssey is to give a couple of talks at the GOVIS 2007 conference in Wellington, New Zealand – something I’m really looking forward to: they also have some good speakers. But since NZ is diametrically opposite us on the globe, it doesn’t make much sense to go there without doing a stopover or two on the way, especially since it doesn’t cost any more to do so. Some of these stops are for business, some for pleasure, and some of necessity to connect the others. OK… I guess I didn’t really expect too much sympathy. It’s always a bit embarrassing to discover that a friend has been involved in a really good initiative and you didn’t know about it until months later. I was even invited to the launch, but was away at the time. So I’ve just discovered (sorry, Vicky!) 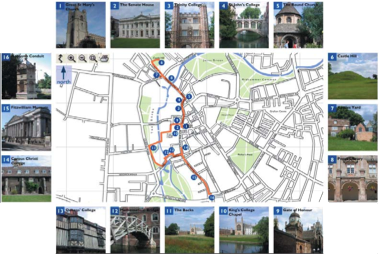 the Shape Walks guides to Cambridge, created by Stride Design and Shape East, and in particular the audio guides, which you can download into your iPod or phone and then stroll (or stride) around the town with a very nicely-produced commentary on your surroundings – especially if you’re interested in architecture. If you’re feeling a bit less energetic, you can click on their online map and hear the tour commentary through your browser while sitting at home in an armchair. I went looking to see if Stride had done this for any other towns and found just one more – amazingly, for me, it’s for Ware, in Hertfordshire, where I grew up, and which I now discover I knew very little about despite living there for 15 years. These are very good; every town council or tourist information office should commission one. 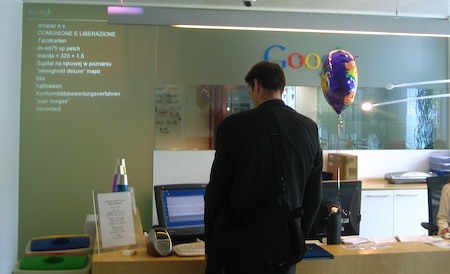 On the way out I noticed that, next to the reception desk, there was a scrolling display of search terms that people are currently using. This is standard now in many of the Google offices, I believe. Here, it was rather nattily projected onto frosted glass. On the way home, I was wondering how they… ahem… sanitise it. Obviously, there are some search terms that could simply be excised using a checklist. Others could be filtered out based on the content that was actually returned as a result of the search. But I wonder how many embarrassing phrases, politically-controversial assertions, etc, slip through… Can they filter it algorithmically? Or is there somebody hidden away on some Google campus whose job it is to weed out the unpresentable? Panic Inc have just released their new Mac application, Coda. This came to our attention initially because we’re also developing something called CODA, albeit in a very different space. Pity, but there are lots of other codas out there (codi? codae? ), so I guess there’s room for us all! Anyway, I had a bit of a play with Panic’s app last night and it’s very cute. Panic are the guys who make Transmit, widely acknowledged as the best FTP app for the Mac, or, it is generally agreed, for any platform. So new products are watched with interest. CODA is an editor for web developers. It’s not a Dreamweaver or anything like that, but for those (like me) who want to write HTML and CSS directly, it’s a very nice package. When you open a ‘site’ you get tabs for source editing, CSS editing, preview, and an SSH terminal, all with file access provided by their FTP/SFTP/Webdav engine. Here, and here are a couple of reviews if you want more details and some screenshots. The Edgeline system is apparently so ink-efficient that HP can’t sell the units at competitive prices and make up the difference on consumables sales like it does with its inkjet and laser products. Instead, HP will rent the printers to high-volume customers, with a typical contract running for four years at 20,000 pages per month. Elton John has the reputation of writing his songs in very short periods of time. Richard E Grant puts him to the test. Quite fun. The original YouTube video has now been removed, but you can still see the clip here. This is probably at least partly staged, but I don’t think it’s a complete set-up. 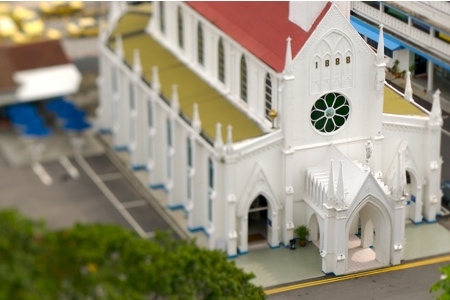 Well, actually, it’s not a model – it’s a real church. It’s part of an extraordinary series of photos by Keith Loutit showing views of his native Singapore; the architecture of which he describes as ‘almost too perfect’ in the newer housing estates. 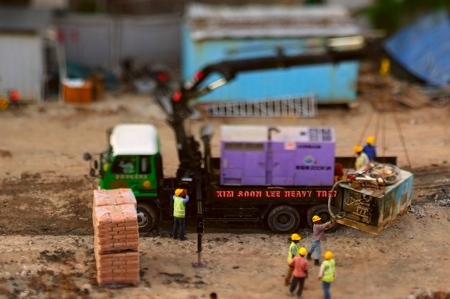 He’s used extremely shallow depths of field and tilt-shift lenses, and the result, I think, is reminiscent of a macro lens, or even of the way the eye focuses at close range, hence the feeling that you’re looking at a model. It’s accentuated by the fact you’re viewing them from above; most of the photos are taken from the apartment tower blocks. It’s worth having a look at the others. I heard about this on Jeff Curto’s Camera Position podcast. If you have a file that wants to open with a particular app, you can right-click and use ‘Open with…’ to pick a different one. If you decide you want to make that the default behaviour, you need to go into Get Info and select the application to be used for this file in future. Not exactly tricky, but a little long-winded. I discovered this morning that if you do an Option-right-click, the ‘Open with…’ becomes ‘Always open with…’. It sets the default and opens the file at the same time. I always open PDFs using Preview, except for a few complex ones which require a full Acrobat Reader, because Preview is generally much faster. Occasionally, though, PDFs from other people or other apps open in Acrobat by default, and, since I normally realise this just as I’m abaout to double-click them in the Finder, it’s handy to solve the problem quickly once and for all at that point. Perth (Australia) – A teenager managed to outsmart YouTube by sending DMCA notice that forced the video sharing giant to take down hundreds of videos. The 15-year-old Perth boy pretended to be with the Australian Broadcasting Corporation and requested that clips from the show “The Chaser’s War on Everything” be removed. YouTube complied and many of those videos are still offline. YouTube’s lawyers tracked down the boy who has since confessed and apologized for his misdeeds. The interesting part is that the broadcasting company didn’t have any problem with the YouTube clips and its executives actually encourage clips to be shared. Sad, but not entirely unexpected: AP report that Apple have delayed the release of the next version of their OS until October. The reason given on their web site is that they needed to divert engineering effort to the iPhone to enable it to ship on time, and that was more important than updating the Mac OS. After the taunts about the repeated delays in Vista, this is embarrassing, but it has to be the right choice.